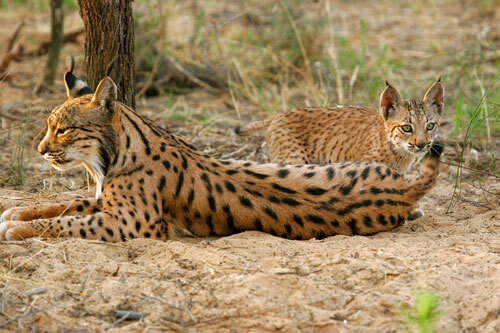 Importance: Doñana is one of the largest and most important remaining wetlands in Europe. It consists of a vast coastal marshland complex in the floodplain of the lower Guadalquivir River, separated from the Atlantic Ocean by an extensive system of both active and stabilised dunes. The area is of international importance for breeding, staging and wintering birds. It is a breeding site of the endangered duck Marmaronetta angustirostris and the rare gull Larus genei. The trees in one area of the vera (grasslands) support a large mixed nesting colony of Ardea cinerea , Egretta garzetta , Nycticorax nycticorax , Ciconia ciconia and Platalea leucorodia . Nesting species also include Anas strepera , Aythya ferina , Netta rufina , Porphyrio porphyrio (1,000-2,000 pairs), Fulica cristata , Himantopus himantopus , Recurvirostra avosetta and Chlidonias hybridus . Wintering species include Anser anser (80,000), Anas penelope (120,000), A. acuta (20,000), A. crecca (170,000), A. clypeata (80,000), Fulica atra (40,000) and Limosa limosa (40,000). Lynx pardina is the most notable mammal. Wetland Types: The area contains fresh and brackish areas, including permanent and seasonal marshes, dunes, and permanent and seasonal lakes. Biological/Ecological notes: Currently the marshes cover 27,000 ha, but they are the last remnant of wetlands, which once occupied 200,000 ha of the lower Guadalquivir floodplain. The stabilised dunes or cotos form an undulating landscape with a vegetation cover varying with the height above the water table. The southern zone of the Cotos is covered by low Pinus pinea forest. The area between the Cotos and the marshland consists of grassland, which is referred to as “vera” because it is always green and lush. The emergent vegetation is dominated by Scirpus lacustris in areas of deeper, more permanent water and by S. maritimus in the seasonal marshes. The flora also includes halophytes from genera such as Arthrocnemum , Suaeda and Salicornia , and Tamarix scrub. Hydrological/Physical notes: The marshes are fed mainly by autumn and winter rainfall and river flow, and therefore show marked seasonal variations in their extent. There are salinity gradients (increasing from north to south and from west to east), while subtle variations in the relief of the generally flat plain lead to the occurrence of deeper areas of water (Lucios) and slight elevations (Caños, Vetas and Paciles). Human Uses: The area is owned by the state and is primarily devoted to nature conservation. Land use activities that are compatible with conservation objectives are permitted within the site. These include charcoal production, bee keeping, gathering of Pinus wood, fishing and extensive stock grazing. There is also touristic development. Adverse Factors: In April 1998, there was an accidental spillage of millions of cubic metres of toxic mining waste upstream of the site, which contaminated a large area with highly acidic material rich in heavy metals. The Coordination Commission mentioned above has provided the principal framework for the authorities concerned to address the clean up and restoration work. In recent years, concern also has been expressed over the impact of mass tourism and intensive irrigated agriculture in the region outside the National Park. There have been fears that these activities are causing over-exploitation of regional aquifers, leading to a fall in groundwater levels and a gradual reduction of the extent and duration of seasonal flooding in the marshes. The biosphere reserve is located in the Gulf of Cadiz and represents one of the most important protected area in Spain. The core area is made up of the Doñana National Park . 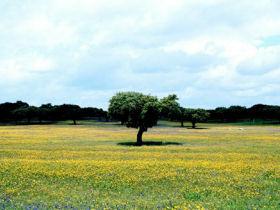 The importance of Doñana is based on the ecosystem variety it hosts and the high number of species that it represents. It comprises sand dunes and groups of shifting dunes ecosystems, some of which move very rapidly. Vegetation cover has stabilized some dunes and there are lagoons and marshy areas in the dune slacks. Almost half of the reserve area comprises swamps on flat clay soil filled with muddy sediments (marismas) with features including canals with slight elevations (‘vetas’ and ‘paciles’) that have been carved by natural drainage; closed hollows ‘lucios’ which hold still water; and ‘ojos’ – points where ground water reaches the surface. The marismas flood in winter, create ideal conditions for large numbers of migrating birds. Doñana is a place of passage and wintering site for over 150 bird species and crucial for the wintering of many aquatic birds such as geese (up to 60,000) and many as 300,000 ducks. Besides the waterfowl, Doñana is home to other interesting migratory species such as the booted eagle (Hieraaetus pennatus), short-toed eagle (Circaetus gallicus) and black kite (Milvus migrans). The palace of Doñana remains a testimony to an exalted past as the favorite hunting reserve of Spanish kings. Some 150 people (2001) live in the biosphere reserve, mainly engaged in agriculture and tourism. More than 250,000 tourists visited the biosphere reserve in 1999. Physical Features Situated on quarternary deposits: mainly sand dunes and groups of shifting dunes, some of which move very rapidly. Vegetation cover has stabilised some dunes and there are lagoons and marshy areas in the dune slacks. The phreatic level is fairly shallow. Almost half the reserve area comprises swamps on flat clay soil filled with muddy sediments (marismas) with features including: canals with slight elevations (“vetas” and “paciles”) that have been carved by natural drainage; closed hollows “lucios” which hold still water; and “ojos” – points at which ground water reaches the surface. The clay sediments of the marshes are rich in calcium and magnesium and the marismas form a diverse mosaic of microhabitats: pools, banks, streams, reedbeds and mudflats. The marismas flood in winter creating ideal conditions for large flocks of migrating birds. Mean annual temperature 17°C and mean annual precipitation 600mm. Rainfall is concentrated in winter with a peak of 110mm per month. Vegetation Plant communities on the dunes have Atlantic – North African affinities and a notable degree of endemism. Rhamno-Juniperetum macrocarpas communities occur on the outer dunes with Rhamno-Juniperetum sophora on the dry inland (established) dunes. Cold sand (Pseudoglei type) vegetation includes Oleo-Quercetum suberis (plantations of cork oak, olive trees and capers), Ficario-Fraxinetum angustifoliae and Viti-Salicetum atrocinerae. The heathland (matorral) vegetation varies with water availability. In the damp hollows Erica scoparia and E. ciliaris occur and on the drier ridges Rosmarinus officinalis, Lavandula stoechas and scattered trees such as Pinus pinea (introduced species), cork oak Quercus suber and Arbutus unedo (occidental Mediterranean communities). In the mobile dune system, there are species such as marram grass Ammophila arenaria, and camarina Corema album. The covering vegetation of the marsh depends on the conditions of the pools and the salt content of the soil. In the highest zones, species of seablite and glasswort Suaeda sp., Salicornia sp., Arthrocnemum sp., are found. The depressed zones of seasonal inundation are covered by sea club rush Scirpus maritimus, bulrush Schoenoplectus lacustris, rushes Juncus sp. and brackish water crowfoot Ranunculus baudotii. Freshwater lake communities are similar to classes Phragmitea, Littorelletea and Potametea of atlantic-european type. Brackish water swamp have communities similar to Spartinetea, Artrocnemetea and Ruppietea of an arid north-african type. Some 750 species of plants have been identified including two species new to science and at least 45 new to Europe. Fauna Contains most of the Mediterranean fauna with a few elements from North Africa and Europe which came down the Atlantic coast. Vertebrates are especially important. Species include eight fish, 10 amphibian, 19 reptile and 30 mammal. Species of particular importance include Valencia hispanica, Aphanius iberos, Testudo graeca, Latastes viper Vipera lastastie gaditana, spiney footed lizard Acanthdactylus erythrurus, Aquila adalberti, Porphirio porphirio, Aythya nyroca, Oxyura leucocephala, slender-billed gull Larus genei, stone-curlew Burhinus oedicnemus, squacco heron Ardeola ralloides. Imperial eagle Aquila heliaca adalberti, short-toed eagle Circaetus gallicus, booted eagle Hieraaetus pennatus, buzzard Buteo buteo, black Milvus migrans and red kites M. milvus, the kestrel Falco tinnunculus, and hobby Falco subbuteo, predominantly in the stablilized sands. Amongst the mammals of this zone are wild boar Sus scrofa, fallow deer Dama dama, red deer Cervus elaphus, lynx Felis lynx pardina, small spotted genet Genetta genetta, red fox Vulpes vulpes and common rabbit Oryctolagus cuniculus. The marsh lies on the west Europe to west Arica migration route and is indispensable as a winter habitat for several species of waterfowl such as the greylag goose Anser anser (flocks of up to 40,000), teal Anas crecca and wigeon Anas penelope. It is also a spring nesting area for Mediterranean and African birds including spoonbill Platalea leucorodia and greater flamingo Phoenicopterus ruber. Important breeding wetland species include marbled teal Anas angustirostris, ruddy shelduck Tadorna ferruginea and purple gallinule Porphyrio porphyrio. Flamingos have also nested on various occasions and have increased during the last few years. Carp Cyprinus carpio and eels Anguilla anguilla are common. Cultural Heritage Donana has a known history of over 700 years. It was the favourite hunting reserve of Spanish kings such as Philip IV, Philip V and Alfonso XIII. It was owned by the Duchess of Alba and formed the backdrop of her portrait by Goya. The palace of Donana remains as a testimony to this exalted past.